Tennessee quarterback Joshua Dobbs (11) looks for an open receiver while playing Kentucky during their game at Neyland Stadium on Saturday, November 15, 2014. KNOXVILLE - Joshua Dobbs threw three touchdown passes and ran for a fourth score Saturday as Tennessee trounced Kentucky 50-16 to continue its mastery of this annual series. Tennessee (5-5, 2-4 SEC) beat Kentucky (5-6, 2-6) for the 29th time in their last 30 meetings. Kentucky lost its fifth straight overall in a matchup between two teams chasing their first bowl bids since 2010. The Volunteers can become bowl eligible by beating Missouri at home next week or by winning at Vanderbilt on Nov. 29. Kentucky, which has next week off, must win Nov. 29 at Louisville to have a shot at a bowl bid. Dobbs went 19 of 27 for 297 yards and threw two touchdown passes to Von Pearson and one to Justin Croom. Tennessee's Jalen Hurd rushed for 118 yards and a touchdown on 24 carries. Austin MacGinnis kicked three field goals for Kentucky, including a school-record 54-yarder. 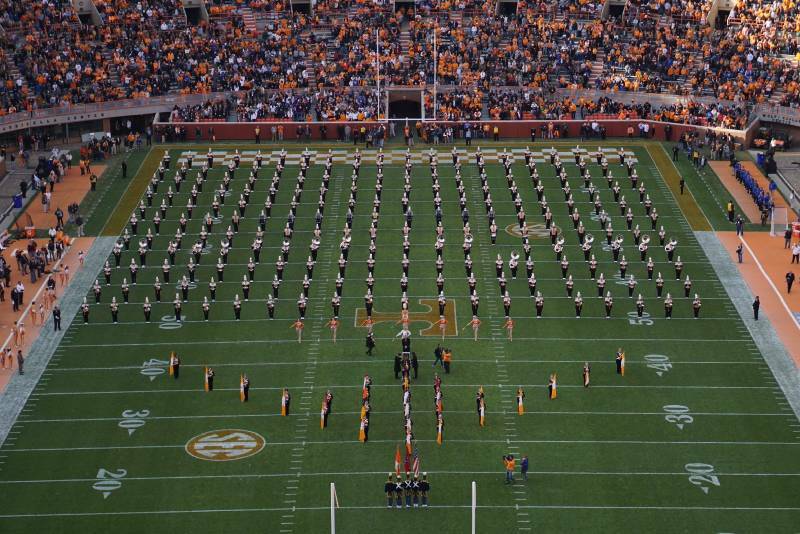 The Tennessee marching band performs before the Vols' game Saturday against Kentucky at Neyland Stadium in Knoxville.